The exhibition will give an insight into the methodology and creative cogitations of Archi-Tectonics, combining the use of latest digital technologies with philosophical approaches that made the office one of the leading teams in the field of research and innovative building design worldwide. The 497 GW apartment building in Soho/New York, completed in 2004, was one of the first realised projects to utlilise parametric design and production techniques. From "Flat Lands & Massive Things - From NL to NYC & beyond" documents how the influences of her Dutch-American biography are consciously or unconsciously reflected in her work. Winka Dubbeldam studied architecture at the Institute of Higher Professional Architectural Education, Rotterdam and at Columbia University in New York where she established her own firm. Winka Dubbeldam is currently also Chair and Miller Professor of Architecture at the Department of Architecture, University of Pennsylvania, Philadelphia and an External Examiner at the Bartlett School of Architecture, London. The Netherlands and New York City, despite their obvious differences, share some significant contextual similarities. Both are characterised by their flat landscape and predominance of the waterfront, and they consequently face the opportunities, as well as the risks of this exposure. In this context the strategy of Archi-Tectonics has been to create a tangible, artificial topography by setting "objects" in the flat city fabric. The arrangement of buildings, which develop from the horizontal to the vertical, thus create urban landmarks in the urban space. This becomes evident in projects like the Blaak Tower in Rotterdam or the project for the Houthaven Pier Towers near Amsterdam. These tall, sculptural buildings in the lower built environment of Rotterdam and at the harbor in Houthaven create significant architectures that give these places a new urban identity. Another focus is on innovative housing, which is a high priority in both New York City and the Netherlands. Optimal spatial formations include: GT House Residence in Upstate New York (2003), Chelsea Townhouse (2012), V33 Condominiums (2012), GW497 Residential Building (2013) and the Brewster Building (2013) all in New York City. Internationally, Archi-Tectonics has built several commercial spaces, such as the ’Ports1961’ stores in Paris, London and Shanghai. New York City projects include the Gear magazine offices (1999), the Duggal Digital Headquarters (2000), the Netherlands Board of Conventions and Tourism (2009), the Moooi Headquarters (2015), and more recently Inscape, a new Meditation Studio (2017). In 2018 Archi-Tectonics won the ’Asian Games Sports Park Competition’ for two stadiums, a shopping mall, a fitness- and a visitor center as well as a vast landscape park for the 2022 Hangzhou Asian Games, China. Awards include the Emerging Voice award (2001), and Winka was among Esquire magazine’s Best and Brightest in the Genius Issue (2004). She was named one of the DesignIntelligence 30 Most Admired Educators in 2015. Archi-Tectonics won the IIDA / Metropolis Smart Environments Award (2006), won the Design Competition for a Sustainable Neighborhood Staten Island, New York (2008), the Hommes Award (2011), Rotterdam, and the 5.5 million s.f. Yulin Art District Design (2012) in China. Archi-Tectonics’ Greenwich Building was honored in the Built by Women New York City Category by the Beverly Willis Foundation and the AIANY (2015). Wired magazine nominated Archi-Tectonics’ meditation center Inscape as one of the 25 best International Architecture projects in 2016. 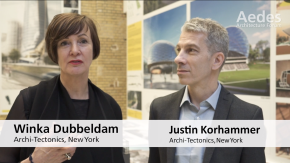 Publications on Archi-Tectonics include three monographs -“Winka Dubbeldam, Architect” (010 Publishers, Rotterdam, 1996), AT-INdex (Princeton Press, NYC, 2006) and Archi-Tectonics Monograph (DAAB publishers, 2010) - as well as countless features in American and International Architecture & Design Periodicals.